TWO OF A KIND: Dr. Brown-Burke shares a moment with mentor and retired PNP stalwarts Portia Simpson-Miller. FROM humble beginnings in West Kingston to her ascension to the post of Mayor of the culture capital of the Caribbean, Angela Brown-Burke has had quite a journey. “I look back and think my mom would be proud,” she tells TALLAWAH, seated across from this reporter around a large conference room table at PNP headquarters on Old Hope Road in St. Andrew on bright, clear Monday morning. She may not have finished high school, but she long brushed off such disappointments to make memorable strides on the journey to becoming a woman of substance who has something significant to offer her country. It’s testament to Brown-Burke’s inner strength and steely resolve. Today, she not only holds a Doctorate in Education, she’s fluent in Spanish and French (a trained translator to boot) and an educator who specializes in mediation and community development. Now, this 50-something all-Jamaican woman, wife and mother, who led the KSAC from 2012-2016, is taking on arguably the greatest challenge of her professional life by wading into representational politics as former PNP leader Portia Simpson-Miller’s successor in South-West St. Andrew, a sprawling series of rough-and-tumble communities she’s committed to uplifting through transformative work and building on Simpson-Miller’s legacy. The regally expressive Brown-Burke has her work cut out for her but, as she tells us, it’s yet another great opportunity to be of service to the Jamaican people. TALLAWAH: You competed against Audrey Smith-Facey to become Portia Simpson-Miller’s successor in South-West Andrew and prevailed as the people’s choice. Congratulations. Why did you want this job? Angela Brown-Burke: I have always wanted to go into Central Government. I like community development. I like working with people and uplifting people. People who look like me. I did that at local government as a councillor and when I was a secretary in Yallahs. So I decided that if the opportunity comes up I would go after it, and the opportunity came, along with encouragement from my mentor and comrade Portia Simpson-Miller. And that’s how I became a part of South-West St. Andrew. TALLAWAH: Have the residents been welcoming? A.B.B: Yes, they have, and I am humbled and eternally grateful that they have accepted me with warmth and an expectation that is enormous. I have committed to continuing the work that Simpson-Miller started, to further uplift the constituency and to see about the physical development of the constituency. 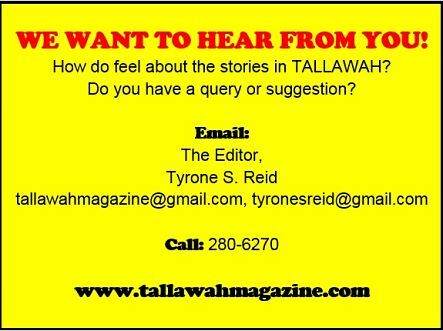 TALLAWAH: How do you plan to get the still-on-the-fence residents on your side? A.B.B: I have started that. You’re going to have people who love you and you are going to have naysayers, so you have to convince them that everything you’re doing is for the benefit of the communities. The approach is simple. The selection is now over. I am the choice. Some people have been disillusioned by the system and I have to reach out to them. I come as an individual with open arms and an open mind, ready to listen and engage you in building your community, because I grew up in a community like yours. I’m a profound believer that the best thing that Jamaica has to offer is our people, so we have to encourage them to be their best. We have a responsibility and an obligation to do that. TALLAWAH: As a first-time MP, what do you want to accomplish in this role? A.B.B: I really want to ensure that we build on the foundation that is there to create an empowered and enlightened citizenry. No one is to be isolated or alienated as part of the process. I’d like, at the end of the day, to have South-West St. Andrew become a model constituency. TALLAWAH: From your vantage point, how are things different in the PNP camp since Portia Simpson-Miller stepped down as party leader – and her recent departure? A.B.B: When a new leader comes, members go through their own periods of reflection. I think she gave a wonderful speech when she called on us to be part of the army and to move forward with Dr. Phillips. She has set that tone. We now have to be a united team going forward. People are coming to terms with the party under Comrade Phillips, and we are ensuring that he has the tools for success, so that we can become the kind of party that Jamaica wants to see. We are living in the moment, and in all that we do we have to protect the legacy of the PNP so that the future generations will say that this generation served them well. TALLAWAH: Speaking of future generations, how close is Jamaica to achieving the Vision 2030 model? A.B.B: It depends. There are a number of parameters to consider. We are further along in some areas than others. We are doing well in education, but we still have some gaps. We’ve broadened access to education but quality is something we still have to deal with. In terms of political representation, we’re not doing well. This year has not been our best as far as sports; many lessons to learn. It’s not always about winning but doing our best. There are some environmental issues we still have to deal with. We have to bridge the gap between the rich and the poor. Poverty has been holding us back. We have to find work for our people. TALLAWAH: From 2012-2016, you were one of the most popular mayors in the public eye. What do you consider your greatest achievement in that capacity? A.B.B: In living memory, the KSAC before me never had a strategic plan. We got that done. We engaged the people around the idea of a clean, safe and thriving city. We built a more robust partnership with the police. People still talk about our civic agenda, including the many events we put on to give back to the citizens. Town hall meetings were a regular feature, and in large measure those things helped to bring local government closer to the people. TALLAWAH: As history has shown, politics can be really unpleasant business. What’s your strategy for dealing with the negativity that’s out there? A.B.B: That can be a real challenge, but you have to live by your principles. I’ve tried to balance things out by acknowledging that you will never be able to please everyone. I see life as a series of choices to make, some more serious than others. You won’t always get acceptance but you have to build relationships and be your authentic self. Understand your strengths and weaknesses and work to improve. TALLAWAH: That’s especially true for women striving to make it in politics. A.B.B: Life for a woman in politics is difficult. It’s a male-dominated field. An independent, assertive woman in politics is guaranteed a hard time. I hope that I can make a difference for those who come behind and inspire hope for those currently in power. TALLAWAH: Tell us about Angela Brown-Burke the wife and mother. A.B.B: I’d like to say I was a great parent, but my sons won’t necessarily agree. They think we made too many sacrifices. But we’ve brought up children [four sons, aged 21 to 32] with a conscience and who’ve become productive citizens. That’s all you can hope for. As a wife, it helps when you and your partner share the same views. Life for [Paul and I] has always been about choices and creating a healthy balance. Those of us in positions of leadership have it harder than others. TALLAWAH: Finally, do you want to become Prime Minister of Jamaica? A.B.B: That’s not in my thoughts for now at all. I’m just focused on being a good MP, not just by my standard but by the standard of those I’m seeking to serve.